It might be channel 9 on Comcast within the Burlington service area, but does anyone know what channel the local Fox 44 channel is on for the Montpelier Comcast service area (is it channel 2 or some other channel)? A bit rocky on the audio, but I guess that's to be expected on the first night. The giant "WAR ON TERROR" graphic also made me a little nervous - not sure how much influence the network boys in NYC have on local broadcasts. In the Montpelier area it is channel 11. Nice to have another news channel but I'm not sure I can believe or trust anything that has the name FOX attached to it. good one, david. Try watching it as enterainment or schtick. Nice to have another news channel but I'm not sure I can believe or trust anything that has the name FOX, or NBC, or ABC, or CNN or CBS or Seven Days or WSJ or NYT, etc., etc., etc. attached to it. I just checked the TV and Comcast channel 11 is Bravo in the Montpelier service area. "Nice to have another news channel but I'm not sure I can believe or trust anything that has the name FOX, or NBC, or ABC, or CNN or CBS or Seven Days or WSJ or NYT, etc., etc., etc. attached to it." Yeah. You shouldn't accept what you hear or read in the "news," whether its the Wall Street Journal or Seven Days or Democracy Now. They ALL either: a) don't know the complete story, b) don't tell the complete story, or c) have an agenda. Some sources may be generally more reliable than others, but not all the time. Glad to see some new and refreshing faces, ideas and talents at work. 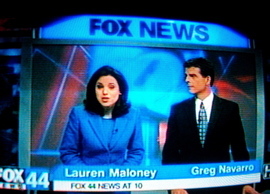 Had not managed to remember to tune in the Fox 44 news at 10:00 PM until this evening. They seemed to have put a bit of resources and money into this effort, lots of frills and fancy high tech stuff -- impressive, so much so that they it seems they cannot afford either a real news desk (but that silly thing they stand in front of at times) or chairs for the the poor co-anchors yet(? ), since they are standing up during the broadcast. Hmmm. First things first, I guess. Seems good from what I can tell thus far. I suppose it is nice to have a "new and different" version of the same old thing. "impressive, so much so that they it seems they cannot afford either a real news desk (but that silly thing they stand in front of at times) or chairs for the the poor co-anchors yet(? ), since they are standing up during the broadcast."